I’ve got a busy week lined up including a visit to the Spirit of Christmas fair, a belated birthday treat of afternoon tea at Claridges and a Cath Kidston Press Show. Let’s start off this Monday by featuring an interview with florist Benjamina Fedaraviciute of InDeco. More than ten years ago, I was doing an English Language course in Greenwich in London. I had lots of free time on my hands and thought to myself, what would I like to do for my soul? I can’t sing and I’m not a very good dancer either. I’ve done art for the majority of my life, so that wasn’t on my list. But flowers…I’ve always been passionate about flowers. But, believe it or not, back then I didn’t even dream of becoming a floral designer. I started my business with my twin sister, just a couple of years ago. We mainly do wedding flowers and create floral designs for photo shoots with amazing photographers. We’re based in London. You can often find me at New Covent Garden Flower Market. But the majority of the time, we work from our home in Kent…the garden of England. When we’re bigger, we plan to get a cool studio with loads of space and, more importantly, lots of light! We mainly create wedding flowers and fresh floral props for editorial photo shoots. We love to do the photo shoots as every time it’s a different theme and a different brief. And more importantly, we have a chance to work with highly creative people. Could you tell us about the floral accessories you make? Being in art all my life…starting at primary school, then secondary school where I specialised in art, doing a degree in Interior Design and a countless number of courses related to art…I guess I’m quite a creative person. I absolutely love innovative designs, always thinking outside the box. I believe that nothing is impossible. And there’s nothing you can’t create from flowers. 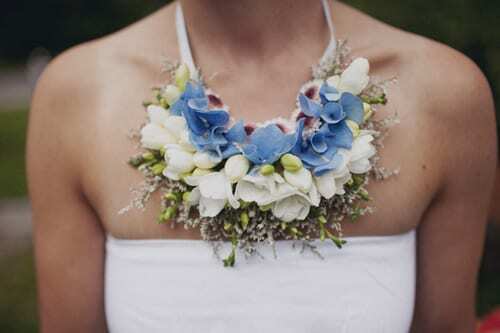 That’s how my very first idea was born…I wanted to make bridal accessories from fresh flowers. 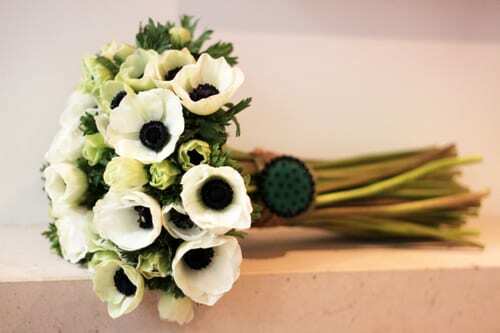 At the end of the day, who says that a bride has to have a bridal bouquet? Why can’t she have a necklace, bracelet or an extraordinary head piece??? Although my very first accessories were made for an editorial shoot, I’ve learnt that bridal accessories are the most delicate, pristine, fragile and absolutely stunning designs that I’ve ever worked with. I’ll be exhibiting some pieces at the National Wedding Show in Olympia in London next spring. We wouldn’t like to be ‘pigeon-holed’. 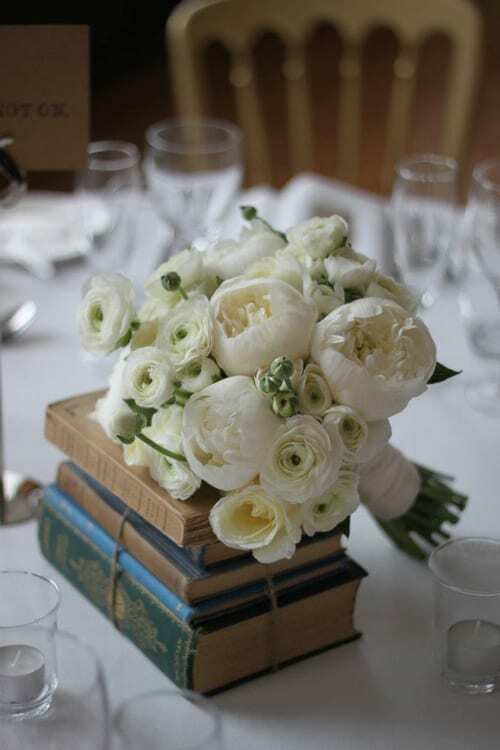 We’ve done lots of vintage style floral designs, but also contemporary and classic ones. I would say that we’re very trendy floral designers…designers with a soul! 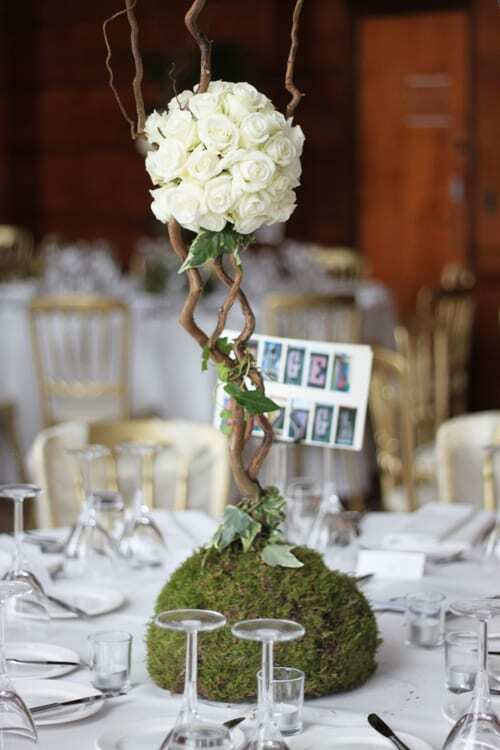 We’re so passionate about flowers, decorations and weddings themselves. Any wedding is music to our soul and it’s our pleasure, not a job to do! Our aim is to keep our customers happy and our brides smiling, not only when they leave after a consultation with us, but also when they receive their beautiful flowers on their big day! Apart from that…we’d like to spread the happiness, love and beauty of our floral designs. That’s such a tricky question. Today, my favourite flowers are ‘Mimi Eden’ spray roses. If you ask me tomorrow, it will be something completely different…my mood, time of the day, season and weather are all factors which influence my likes! But I always follow my heart! Many thanks to Benjamina for all her help in compiling today’s blog post. I just love the floral eye mask and ear muffs she’s created! …I absolutely adore all floral accessories! Incredible designs,great ideas and vision.Outstanding!! !